While retailers have improved in areas such as refunding delivery charges, there is still room for more flexibility and simplicity in returns policies. For example, 52% of retailers studied didn’t offer any choice of return methods, while 9% of refunds took more than 14 days to arrive. Under the Distance Selling Regulations, retailers are obliged to refund the original delivery charge in addition to the cost of goods if the retailer is informed within seven days. The study found a 77% increase in retailers refunding the delivery charge compared to last year. However, despite the fact that every item was returned within three days of receipt, 125 retailers in this study failed to refund delivery costs. I wrote a post about charging for returns last year, after having to pay a £10 charge to return a £40 item. While I understand that retailers have costs to cover, it would make me think twice about ordering from that retailer in future. A free, no hassle returns policy can help to drive conversions, especially when it isn’t always possible for customers to tell how the item will look / fit etc once they receive it. Of course, if retailers end up having high returns rates, then they these delivery costs will be eating into profits, but they also have to consider the costs of annoying customers and deterring them from future purchases. Only 35% of retailers covered the costs of return, with multichannel retailers (37%) more likely to cover costs that pure plays (33%). For customers buying online, multichannel retailers do have a potential advantage over pure play rivals, since they can offer returns to a local store as an option. Many customers will find this more convenient, and if promoted clearly this can help to drive sales. However, just half of the multichannel retailers in the study allowed customers to return items purchased online to their nearest store. This is clearly something that 48% of the store retailers in this study need to look at. Sure, there may be organisational issues which make this harder to implement, but customers shopping from multichannel retailers will naturally expect that they can return their purchases to their local store. As far as they are concerned, it’s all the same company. There are also potential benefits for retailers here. For some products, phones or laptops for example, it may just require some advice from in store staff to get them working, and perhaps remove the need to return goods. There are also up-seling and cross-selling opportunities when customers return items in store, and it provides an opportunity to retain that customer with some friendly service. In contrast, one way to annoy customers is to make returns polices too complex, and make customers work too hard. Snow Valley returned 183 of the items by post and in 13% of cases had to email or call the retailer’s customer service department before we posting them. While 59% of retailers got it right by providing a returns form with the delivery, 22% of retailers failed to provide returns instructions with the order, while others forced users to call, email or head online for an authorisation code. Perhaps some retailers think that making the returns process too easy will reduce returns rates, but making customers work too hard is more likely to deter them from future purchases. What are the major issues that retailers need to address with their returns policies? We looked at the returns process from a customer perspective and for us it’s about getting clear returns instructions in the package, a simple returns process, a quick refund, and if something goes wrong we want it put right straight away. Most retailers we tested seemed to go along with this but I think the issue for many lies in finding a returns proposition and process that works for both the retailer and the customer. If you’re a high volume clothing retailer like TopShop, then you have ’re going to get a lot of returns and you need to make that process a) a selling point and b) as efficient as possible, both to keep operational costs down and to keep the customer happy. If you’re Tesco Direct and you’re selling everything from a cuddly toy to a lawnmower, then the process might not be as simple as filling in a form and taking it to the post office. I might need to call to ask how I can send the Flymo back. As a customer, I don’t mind doing that if it means that I get the most hassle-free service and I get my money back quickly. Ultimately it’s about retailers aiming to deliver a good returns service, recognising what that looks like for them, explaining that clearly to the customer, and then executing it well. You mention in the press release that, unlike your other reports, there is less evidence of across the board improvements in returns. Why do you think this is? I think that delivery is very much tied in with conversion and getting the customer to make a purchase. Because sales are target driven, delivery gets constant attention to make it better, and retailers offer more options, speed it up, improve the last mile etc etc. In most cases, the process of returns doesn’t get the same attention and so we don’t see the same improvements in every area, though we are seeing improvements. I was definitely impressed by TopShop and Laura Ashley store staff knowing about the Distance Selling Regulations and it’s really good to see that all of the stores are now accepting online returns without batting an eyelid, but we just don’t tend to see the same positive change in every area. Econsultancy’s first Marketing Attribution Management Buyer’s Guide looks in detail at this fast-growing market, with profiles of the leading players and tips for those looking for a supplier. Here, we outline five of the most important considerations for those looking for an attribution vendor. 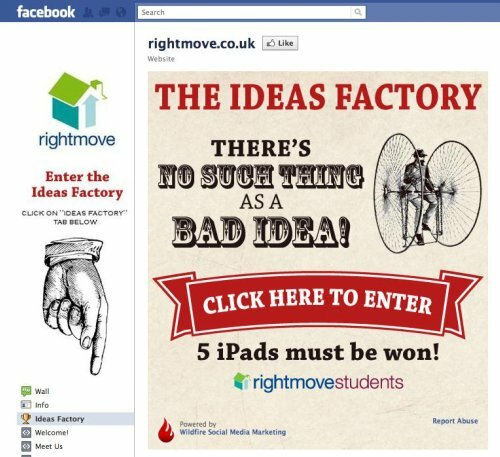 With its new Facebook campaign, property website Rightmove is aiming to get people involved in suggesting new features for its website.